In April of 2007 during a Google search for “daily prayer book”, I found the Celtic Daily Prayer book published by the Northumbria Community. I bought a copy, and it quickly began to transform my devotional life. It wasn’t until a full year later that I realized the “NC” was headquartered in the same county that my ancestors hail from. I made contact with the NC through their online forum, and became a Friend of the community in 2008. “I’ve been dying to pass this bit of news on to you for months, Dan – the new Nether Springs will be located at Acton House – which is only about one mile away (to the south towards Felton) from Hazon! How about that! 149,000,000 square kilometers of land on the planet, and the place where my ancestor, Hugo de Heisende happened to lease 100 acres of forest in 1202, also happens to fall in the same ONE square kilometer as the home of the life-changing community which “fell into my lap” through a Google search in 2007? I didn’t even connect the two for over a year! And the community didn’t even move until a year after THAT. After much planning, prayer and the end of a 2 1/2 year long journey of selling my late father’s house; my wife, daughters and I will indeed have the chance to “walk across the fields of Hazon” in just over a month from now. 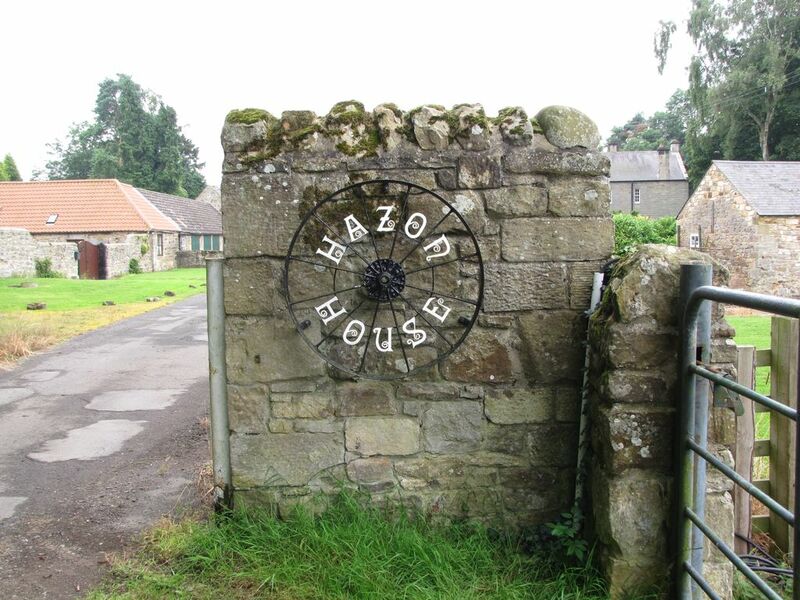 We will also be visiting my mother’s family’s ancestral home (which is less than 100 miles from Hazon, by the way) and many other sights in the U.K. The goodbyes at Nether Springs were hard. It really felt like I needed another week. In fact, Pete suggested as much. I was feeling like I was just finding my feet and then it was time to go. . . .that was Thursday last week. It’s 7 days later. . . Sitting in the train station in Oxford, having just received a nearly personalized tour of C.S. Lewis’ home, “The Kilns” conducted by Dr. Debbie Higgins, the Resident Director of the Lewis Foundation. Lindisfarne, or Holy Island has been a place of Christian worship since the 6th century. It is the taproot which anchors the massive tree of Celtic Spirituality into the soil of Northumberland. The tone of this silly little blog might be a bit different for a few installments because I’ve got behind, and am now writing when events are not so fresh in my mind. My mouth went dry (partially because it was hanging wide open) and my heart skipped a couple of beats. ” . . .right then . . . Whatdya’ ya want from me?” he asked, the distant shadow of a smile emerging on his face. It’s hard to know where to begin . . .
We walked the lanes of Hazon today, and there was more to it than I had thought. I squealed like a schoolgirl when we passed the sign on the A1 yesterday. It read “The Holy Island of Lindisfarne”. Thursday morning, sitting in a coffee shop looking at Edinburgh Castle, watching the workaday Edinburghian make his/ her way to the kilt factory or the golf course or the haggis plant. We spent most of our day at Cawdor Castle, home of one of the major branches of Clan Campbell. It was a good day, lots of laughs, beautiful gardens. Yesterday was a real mixed bag. . . .mostly cool stuff. Today marked a significant event in this trip: Driving on the left side of the road. The English get technology in a way we do not. Perhaps it is how they apply it. – A washer dryer in one unit the size of a small filing cabinet. 1. 11:00 AM worship at St. Matthews, Notting Hill. My first Anglican service. So much to share about this, currently bursting. I’ve been anticipating the 10th. I get shivers typing it out. We leave on that very pilgrimage in just two days.